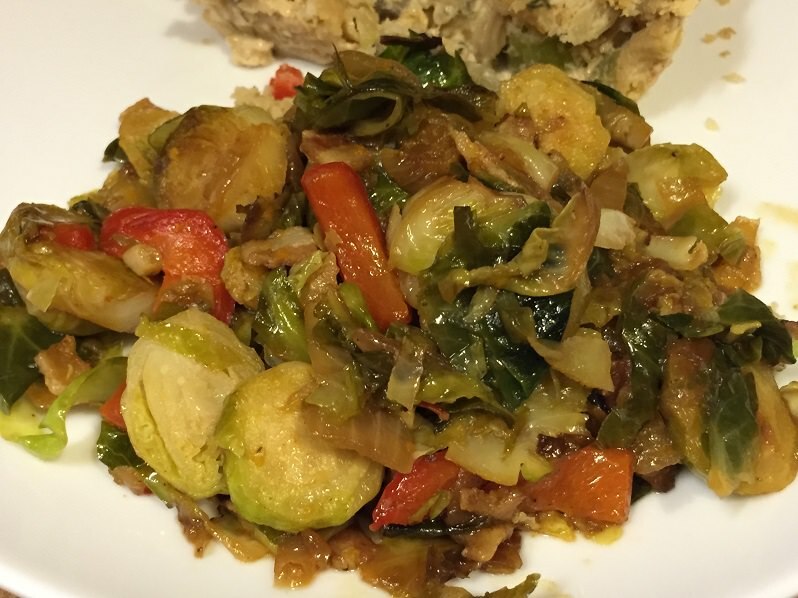 A quick side dish that will even have your Brussels sprouts haters seeing the light. After all, how can you go wrong with bacon, onion, mushroom and red bell pepper? Some dishes I take for granted, like this one. It’s pretty flexible. If you’re out of one thing, substitute something else. But, you really do need some kind of pork and I can’t imagine making it without onions and garlic. If you don’t have red (or orange or yellow) bell pepper around, you can add a bit of sweetness and a pop of color with sun-dried tomatoes, grape tomatoes or dried cranberries. The other night I made a boneless leg of lamb—swoon—and didn’t get my vegetable act together until quite late. I had greens in the frig but I just didn’t feel like destemming them and washing them and slicing them—you know the feeling. Lazy. Luckily, I had a package of Brussels sprouts in the freezer. I don’t even remember buying them—must have been a sale—but I’m glad I did. All of a sudden, I was inspired to chop. After five minutes or so, I had chopped bacon, onion, mushrooms and red bell pepper in the pan sizzling away. With little effort, I had the perfect accompaniment to our rosemary and garlic lamb along with its bed of roasted potatoes, carrots, parsnips and onions—the perfect Sunday dinner. You’ll need a large skillet with lid. In a large skillet, cook bacon until it just begins to crisp. Add Brussels sprouts, onion, mushroom and red bell peppers, and cook until softened. Add garlic (and optional sun-dried tomatoes or dried cranberries), cook until garlic begins to golden, about 1-2 minutes. Add chicken broth and cook until it’s absorbed. By now the Brussels sprouts should be tender as well. If not, cover the skillet and let it steam, adding more broth or water if necessary.